Many people wonder when and how to prune their tomatoes. 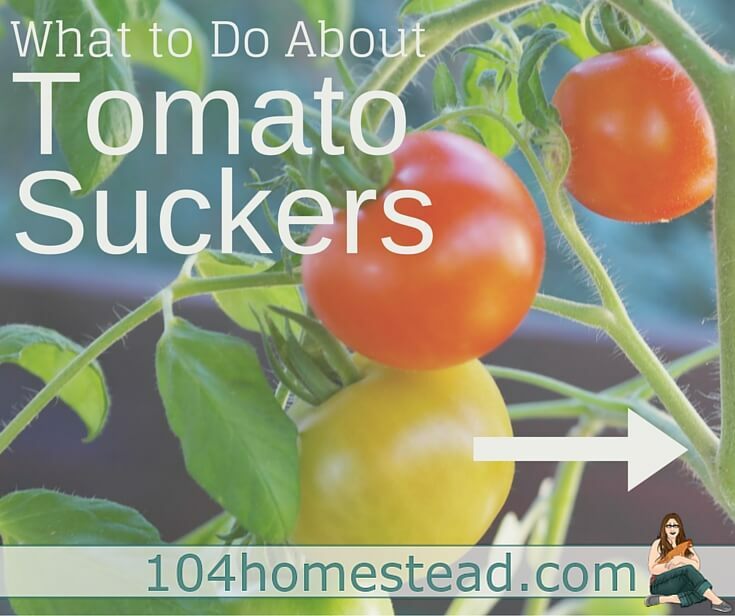 If you’re like I was, you may not even know anything about tomato pruning and tomato suckers. For years I put plants in the ground, topped it with a cage and waited for it to do its thing. I’ve grown so much and I’m here to tell you what I’ve learned. 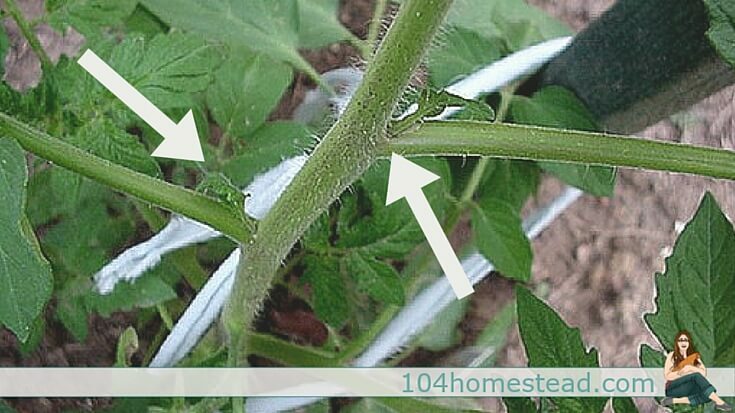 Pruning tomato plants can maximize the number, size, and flavor of the tomatoes… most of the time. Before the plant begins producing flowers, it puts its energy into producing stems and leaves. Soon little side shoots called suckers begin to emerge. Suckers are new branches that grow in the crotch between the main stem and a side stem. 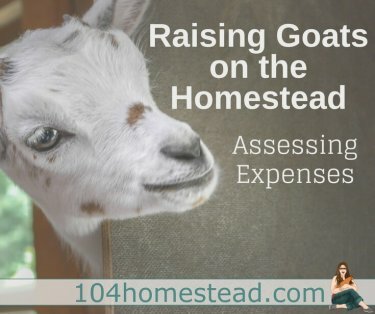 These suckers have a late start and tend to be weak. They do produce fruit, but often it is inferior quality. This is especially true of suckers near the top of the plant. By removing these suckers, the plant can use the waste energy to go towards the branches that are strong and healthy. Removing suckers also cuts down on the risk of disease. Weak, limp branches frequently hang on the ground where they are susceptible to fungus and rot. A final reason to consider getting rid of those suckers is that they cause an unnecessary shading to lower branches. As we know, the more sun, the more productive the tomato plant. 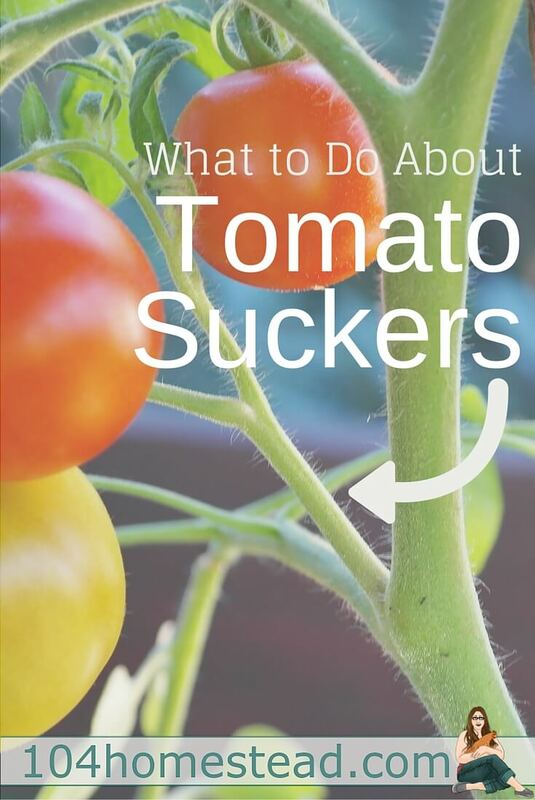 If you are growing a determinate (also known as bush) variety of tomatoes, you don’t need to remove suckers. These plants are only going to get so big, therefore you are not helping them better utilize their energy. If you are growing an indeterminate (also known as vining) variety on a fence-style trellis, you only need to remove the suckers below and above the trellis. For example, my field fence trellis is mounted 1′ above the ground so I can tend the plants from underneath and the fencing is 4′ tall. I remove all suckers in the first foot and any that go beyond the top of the fence. The reason this works for me is that I support the sucker branches by tying them to the fence. They do steal some energy, but they do not touch the ground and they don’t create shade. Although the fruit may not be as large, the quantity more than makes up for it. If the sucker is young and tender, you can simply pinch it off with your thumb and forefinger. This method is called simple pruning. This is by far the best method since the plant heals quickly and therefore there is less risk of disease. If you have waited a bit too long and your suckers are larger and stronger, you may want to use garden shears so you don’t hurt the plant trying to pinch. Be sure to disinfect the tools (I like to use vinegar) so you do not infect the plant. You may also choose to remove leaves and stems below the first fruit cluster while you’re pinching your suckers since, like the suckers, lower stems tend to yellow and touch the ground. Do you remove tomato suckers? How have your results been? I’d love to hear your experience. Be sure to comment below! I have always pinched of suckers the second I see them. Since, I’ve my yield and size of the fruit has surpassed others, including taste and believe it, texture… why mess with such a simple way to keep your plants healthy. Place the larger suckers in water. They will root and provide the next setting of plants. Let the suckers grow until the first flowers appear. Keep the sucker below the first flowers. Allow it to grow as with your main stem. Prune out every other sucker that appears. Thus, you have 2 stems, which you stake or support as normal and each will bear abundantly if watered etc appropriately. My source for this tip is the book “Yates Garden Guide” and they say that the second stem, as above, is the strongest one that the plant will produce. I can only say that it gives me great results. You can find Yates on the web at http://www.yates.com.au. They are a family of seed distributors who’ve been going for over 100 years, I think, and my copy of their guide is over 20 years old, but I still rely on it. Naturally, the seasons are reversed for you. Anyway, I love your site and I hope that you and your family have a Merry Christmas and a Happy New Year. Never knew that info. I guess I’ll be better prepared for next year! I grow all my tomatoes in cages, and I never sucker. I do sometimes pinch the tips back when they get too big for the cages, but that’s all I do. Thank you thank you thank you! I’ve heard of “suckering off tomato plants” and we’re growing a vining tomato in our square foot garden. I’ve been meaning to look up what to do, but have been putting it off. Then I saw your post on Pinterest this morning. Perfect timing! I’ll be examining my plants this weekend to see if I should be pruning!